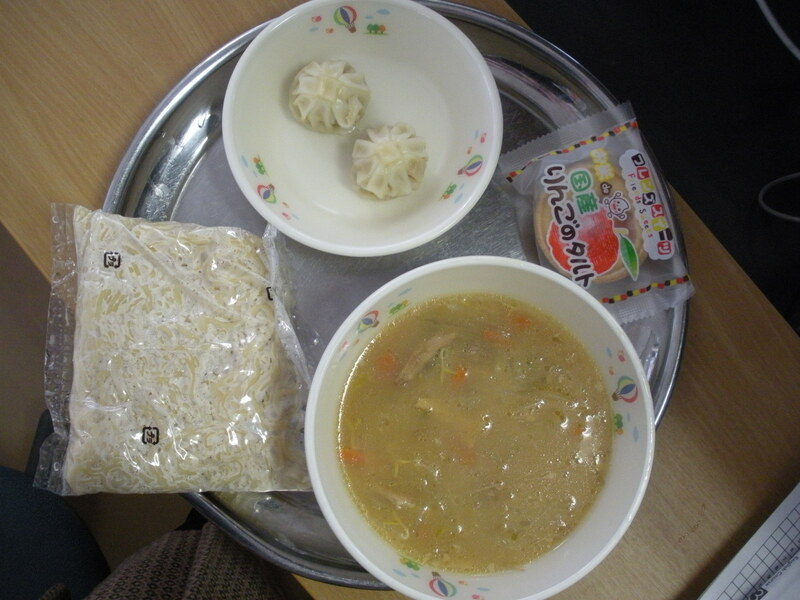 From Jan. 24th to 30th is “School Lunch Week”. Let’s eat lunch considering by what people’s efforts we are able to be served the school lunch we so thoughtlessly eat every day. Today we had the always popular Okome de Tart! It is really delicious. The name of the tart in Japanese is “okome de kokusan ringo no taruto”, which literally means “Tart made with rice and grown-in-Japan apples”. When we first received the lunch menu for this month, I could overhear some of the teachers talking about it. One of them said it was strange that the tart’s name specified that the apples were “kokusan” ie: grown in Japan. His comment was that, of course! the apples should be grown in Japan: not imported from overseas. But the sad truth is over half of food consumed in Japan is imported. Something surprising is this is a fairly modern development. As recently as the 1970’s Japan was food self-sufficient. I don’t really know how this figure changes so dramatically and so fast. But I thought it was interesting the natural thought for that teacher was that “kokusan” should be a given, not a rare and special trait.